If you have scarves, ties or belts, you know how hard it is to store them. If you fold them and put them in a drawer they may get wrinkled and not look nice. If you have a lot of scarves, belts or ties then it is especially hard to store them you may only have access to the top few because it is too much work to dig around a drawer or bin for a different option. Avoid all of that with our College Closet Accessory Loop! Our College Closet Accessory Loop is a dorm space saver that easily hangs from your closet rod and takes up minimal space. After all, you don't want something bulky hanging in your closet and this College Closet Accessory loop takes as much space as regular dorm hanger! Our College Closet Accessory Loop has a large loop so you can easily slide your scarves, belts and ties across the loop where they will hang wrinkle free and in a convenient spot. 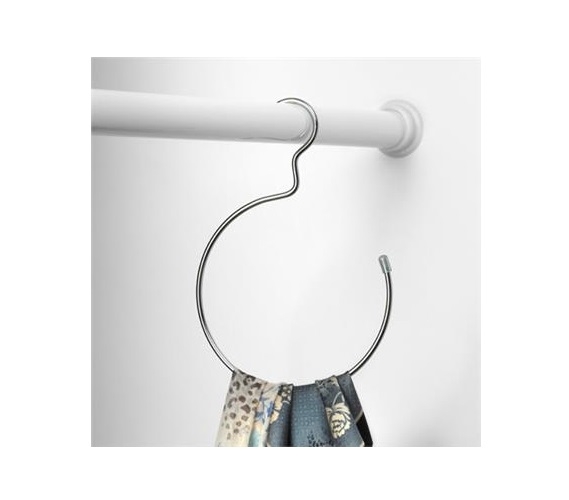 You can even use this handy College Closet Accessory Loop to hold your hand towels or wash cloths! Hand Towels and Wash Cloths may be dorm items that you simply don't know where to store. With our College Closet Accessory Loop, you can easily hang your hand towels from the shelf your dorm microwave is on for convenience or you can still hang the dorm loop in your closet. Plus when you have all of these small dorm essentials neatly organized, you won't have to worry about them detracting from dorm room decor like they may if you have a pile of them that always falls over.